Health and wellbeing don’t need to suffer at this airport. After some exploring during my travel through Philadelphia International Airport, I have rounded up 12 ways to get a wellness infused layover at Philadelphia International Airport. 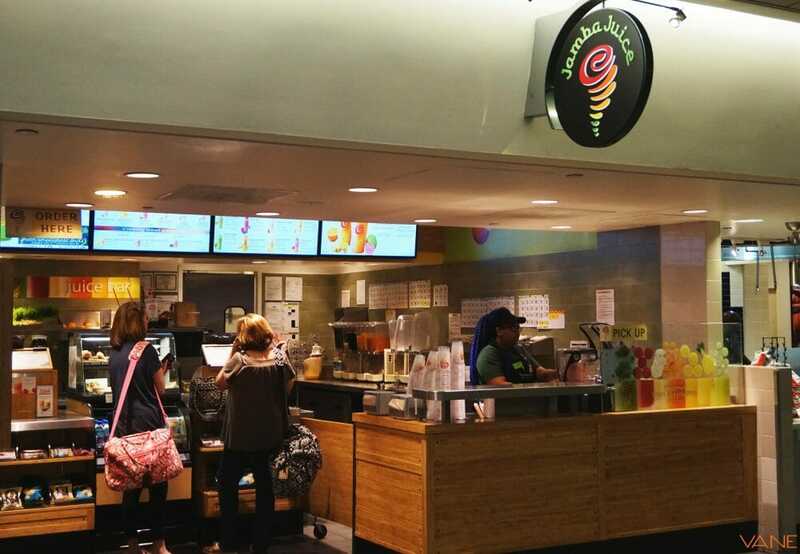 Did you know PHL Airport ranks among the third top healthiest U.S. airports for eating choices? Indeed, there is a variety of healthy food options that span many different cuisines – from grab-and-go entrees to sit-down meals. Philadelphia International Airport makes it easy to eat your way through your layover! There are plenty of places to get some rest around the airport including cushioned massage chairs, crocheted rocking chairs, and your own Minute Suite room. Philadelphia International Airport has a Virtual Library Hot Spot between the D/E Connector. You can relax in comfortable lounge chairs and log on to the Airport’s free Wi-Fi to access the Library’s e-books. There are nearly 1,200 author podcasts, and other digital content to browse through. Here are a few ways you can get some health and wellness during your layover. 1. Fill up your water bottle at one of the airports 12 hydration stations. Get healthy by drinking lots of water. Dr. Nina sites that the health impact of just drinking water prevents cravings from dehydration, minimize water weight, and fights kidney stones. Also, being adequately hydrated may decrease the risk of stroke. In a study at Johns Hopkins University, researchers found 44 percent of patients who had a stroke due to a clot was also dehydrated. So, drink up! Location: All around the airport. 2. Chill out on a rocking chair. Get healthy by releasing endorphins that will elevate your mood. There are many benefits to rocking such as stimulating circulation, improving muscle tone and even some weight loss (you can burn 150 calories per hour). In 1955, former US president John F Kennedy was prescribed a rocking chair by his doctor to alleviate his chronic back pain. Are you feeling some back pain after a flight? Give the chairs a try. 3. Relax in the shower or get a blow-out at the spa. Get healthy via an energized or relaxed boost that can shake off any feelings of yuck. This Xpress Spa location provides hair services such as hair blow outs! 4. Drink up at the many places to grab a smoothie. Get healthy with some fresh juice or smoothies. At Jamba Juice you can get deliciously fresh juice and smoothies! I have often asked what is the difference from a nutritional standpoint – I recently read an article on youngandraw.com that helped clear up some of the misinformation and confusion over which one to choose. Location: Post Security, Terminal D, near Gate D Hours: 7a.m. – 7p.m. Location: Terminal C, near gate C9A Hours: 5a.m. – 11p.m. You can also try these other locations to get smoothies. Red Mango in Terminal F; Pinkberry located in the B/C Food Court; and Currito Burrito in Terminal C.
5. Treat yourself to some avocado toast at many locations around the airport. Diane Gerace, Airport Public Affairs of Philadelphia International Airport shared with us the many locations to find avocado toast at the airport. In B terminal: Germantown Biergarten, Independence Prime, Baba Bar, Boule Café, and La Colombe. Also, at La Colombe in Terminal A-East, C and E; Au Bon Pain A-West, C and F (you can ask request avocado on your toasted Bread, Bagels, and Croissants). 6. Take a nap. Get healthy by closing your eyes and resting. The health benefits of taking a nap are real, especially after a long flight or layover. A study the European Society of Cardiology Congress in August 2015 concluded that taking a midday nap can reduce the occurrence of cardiac incidents quite significantly. 7. Build your salad at Saladworks. Get healthy by eating your fresh veggies. At Salad works, you can custom-make your salad with a variety of ingredients into a fresh salad bowl. We all know the benefits of eating fresh veggies, right? Hours: Daily, 5a.m. – 11p.m. 8. Ride a bike to the airport. Get healthy by taking a long bike ride and improve your health. To encourage bicycling to the Airport, PHL offers convenient bike racks at the airport. For the location of the bike racks and more information on bicycle-friendly commutes to PHL, visit their Pedal to PHL Program page. 9. Get some pet wellness. Get healthy by connecting with an airport therapy dog. We love that Philadelphia International Airport has gone to the dogs too! Stay on the lookout for Zeus. His favorite food is roast beef, and he’ll be strolling around sharing pawsitive vibes. 10. Admire some Green. Get a little nature pick me up at the many green areas around the airport. If you are feeling overwhelmed by traveling, Philadelphia International Airport recently opened a new 315-square foot “Quiet Room” open 24 hours every day. 12. Experience a quick me up by sitting in one of the many massage chairs.